One minute you're viewing craft projects on Pinterest, and the next minute you've left your desk chair empty and spinning from the speed of running from your computer; to drive to the store to purchase all the supplies for a project that you think is the best you've ever seen in your entire life. Pinterest is the reason I bought this sweater from a local Goodwill. 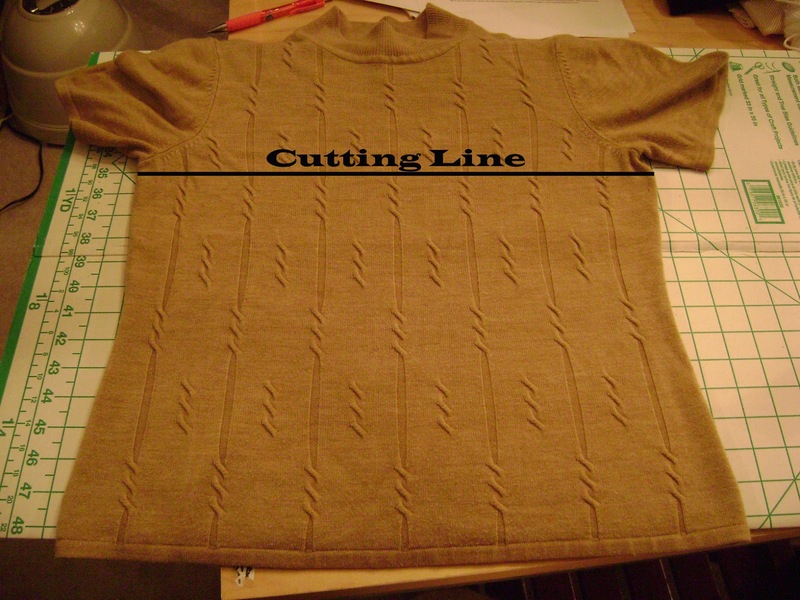 I bought it after I saw a link to ideas for different ways to recycle old sweaters. 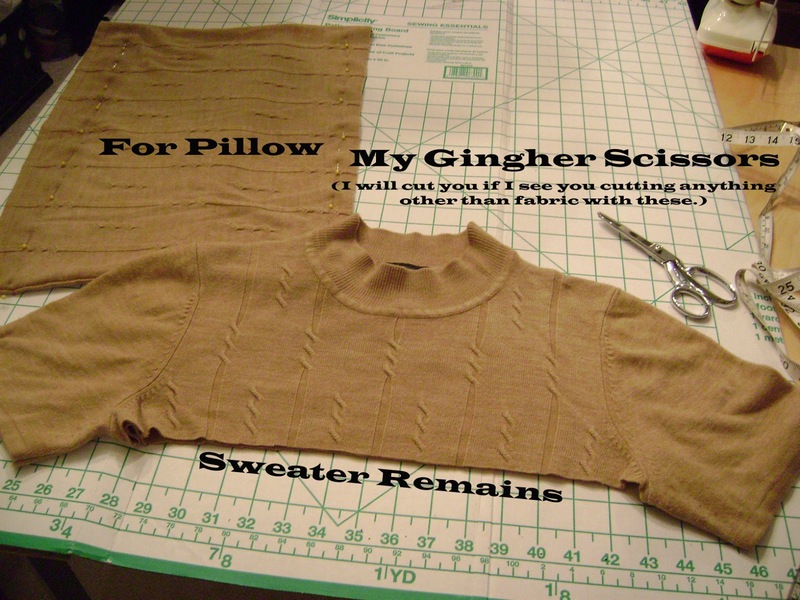 I almost lost my mind at the sheer "awesomeness" of the rather simple idea of using the fabric from old sweaters to make pillows. I've wanted to knit myself a few pillows for a while now, and here was a chance to get them quickly without doing all the knitting myself. File this under, "Why didn't I think of that?" Here's the back, which ended up being the back of the pillow. This was a rather small sweater but I bought it anyway because I loved the cable pattern. I chose to cut along the line in the picture because (1) it would give me the size pillow I wanted and (2) I would only have to sew two seams because I could use the preexisting side seams. I simply sewed the two seams, leaving an opening on one seam to add Poly-fil. After stuffing the pillow, I sewed it closed by hand. 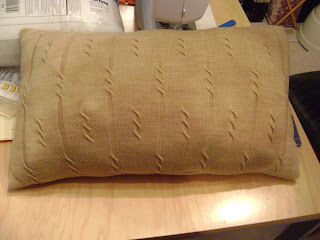 This one ended up being a bit lumpy from the stuffing, and I think I would like it better if I used a pillow insert. I have much more Poly-fil to use, but when it's gone, I'm going to try to make any future pillows with pillow forms. Although, using stuffing would be good for cases where the amount of available fabric isn't enough to cover one of the standard pillow sizes. you can also make your own pillow form usign poly-fil and fabric. That's a good idea. I actually thought about that on the way to work this morning, and wondered if I had some muslin in my stash to do this. Cute pillow and thanks for sharing. 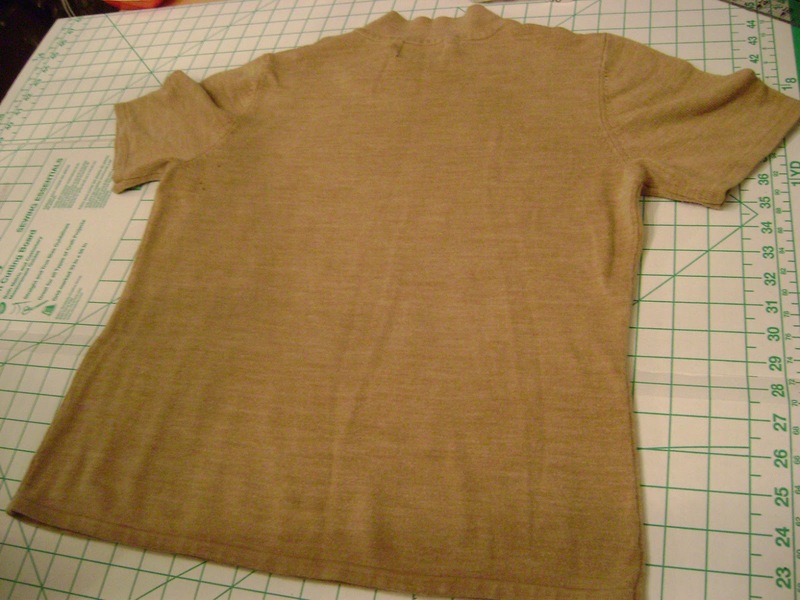 Also, you have given me another use for t-shirts other than making baby hats, etc. I wish I had seen this earlier. just cleaned out a lot of my father's things and he had some sweaters that would have made great pillows. Great idea. Re your lumpy pillow, I learned years ago that the trick to not having lumps is to pull apart the poly fill very thoroughly so you're dealing with bits of fiber strands instead of clumps.